Musical Menus is the area’s best musical revue and a long-standing Clarke tradition. This spring’s event will be presented Thursday, April 4, and Friday, April 5, in the R.C. and Celeste Wahlert Atrium on the Clarke campus. The 2019 Musical Menus theme is ‘New York City in Song.’ Musical excerpts will be from musicals set in New York City and will also include Tin Pan Alley hits. Guests will be entertained with song selections from Guys and Dolls, 42nd Street, Annie, Thoroughly Modern Millie, White Christmas, West Side Story, and many more. Musical selections will also include hits by George Gershwin, Cole Porter, and Irving Berlin, while instrumental music will feature classics by Jelly Roll Morton, Fats Waller, Duke Ellington, and more. 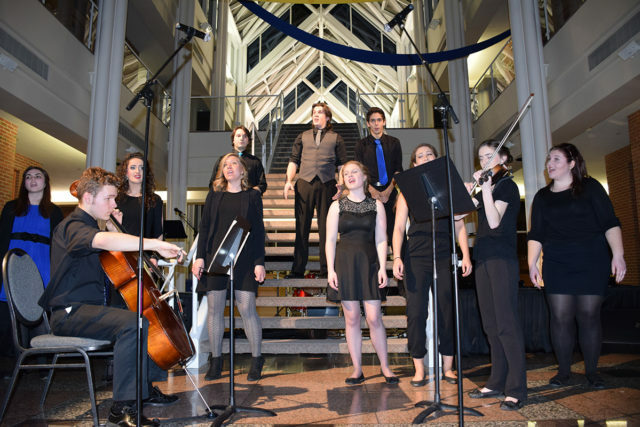 The fundraising event features a gourmet five-course meal served while enjoying musical performances by solo and small ensembles of Clarke University students and faculty. The impressive meal will be prepared by Clarke Dining Services and includes: First Course, prosciutto and fontina fritter, Tuscan grilled shrimp, white bean bruschetta; Second Course, chopped caprese style salad and Brazi bites; third course is a choice between grilled pork tenderloin, balsamic roasted vegetables, parmesan risotto; salmon, Parisian potatoes, watercress, lemon herb butter; or artichoke parmesan, tomato classico, broccolini. The Finale is a mini trio of apple, key lime, and chocolate raspberry tarts. Proceeds from Musical Menus are applied to a variety of Clarke Music Department initiatives including travel expenses for the university’s ensemble tours, private lessons, music scholarships, and new equipment. For more information, contact the Clarke University Music Department at (563)588-6575.